I love it when I find a new food blog. Thanks to this blog, I've added a bunch of new recipes to my "to make" list. These cookies are a new favorite in our house...chewy, tart, sweet & delicious! 1. Preheat oven to 350 degrees. Line cookie sheets with parchment paper or Silpats. 3. Using a mixer, beat together the butter and sugar until smooth and very fluffy. This will take a couple of minutes. 4. Beat in the egg, vanilla extract, lime juice and lime zest. Mix until well combined. 5. 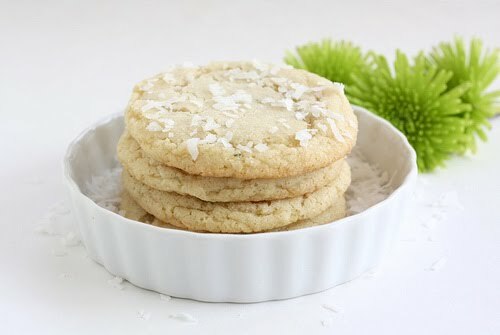 Gradually add in the dry ingredients and toasted coconut. Mix until combined, don’t over mix. 6. Roll rounded teaspoonfuls of cookie dough into balls. Put sugar in a small bowl and roll cookie dough balls in the sugar. Place on lined cookie sheets about 1 1/2 inches apart. 7. Bake 10 to 15 minutes or until lightly browned. The cookies will start to crack a little bit. 8. Let stand on cookie sheet two minutes. Move cookies to a cooling rack.